I didn’t think I’d be revisiting this carving again. But just today I got a call from the Pastor and he had a request. Turns out he had the small sample I had done when I proposed this job but he gave it away. He had it mounted on his office door and everyone loved it. Especially the donor for the large statue. Well the Pastor felt he ( the donor) should have the small carving as a memento to keep at home with him. Now the Pastor was missing his carving and wanted to replace it with another. But this time we decided to make a miniature of the full size statue for his office. This way he could set it on his desk as you would a photo in a frame,, or mount it on the wall, again , as a picture frame. The plan is to mount this carving, done in the same Walnut as the full size carving, on the same style background with some depth to it as if a shadow box and frame it with some Oak as the original was finished. I started it tonight after dinner and at this point it’s only roughed in. 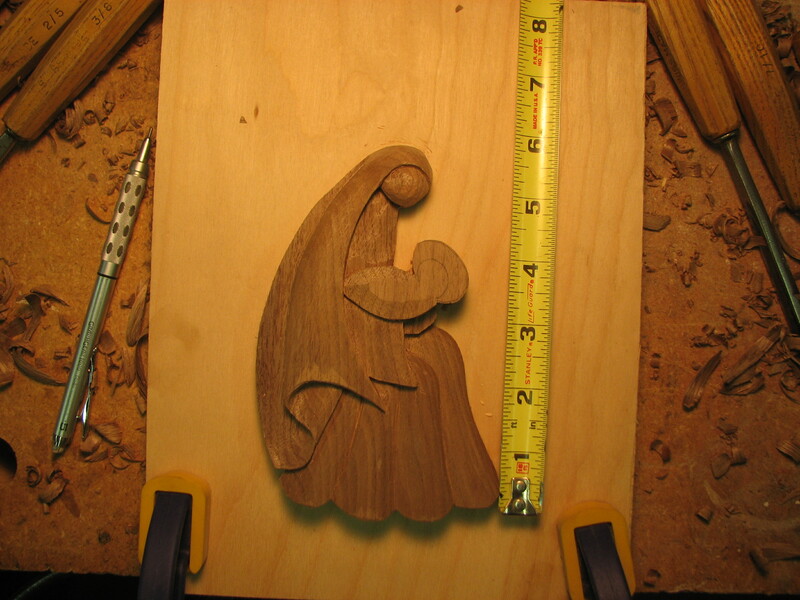 As you can see the baby needs to be carved and then the rest of the piece gone over. It’s 6 inches in height and the thickness of the wood is just under 5/8ths inch. I think this is interesting for several reasons. The topic was brought up at one time in the comments as far as how thick a carving should or could be to achieve “levels” and a look of depth. The natural thought is that thicker is better. Not always. In this case having a thicker piece of wood would not look good considering the size of the carving. Any thicker than this and I might as well carve a 3D piece. The other topic that came up recently as well here on the blog was finishing a piece. Not what type of oil, poly, wax etc. to use but how to achieve a smooth finish on a carving prior to the sealing steps. The idea of a special chisel was considered as being the solution. I disagreed. I tend to think that the best chisel to clean up a carving is the very tool that made the cuts. It’s only natural since the chisel made the cut in a particular curve so use that same chisel to clean up after itself. Now in some cases you will use a similar chisel where you need to flatten ridges created by a deeper chisel,, but in most cases, the same chisel does the job just fine. Now on this carving at this stage, it’s only roughed in. Lines need to be addressed, stop cuts cleaned and a general going over to smooth out the main surfaces. As well as finish carving the Baby and Halo of course. But here you get the idea of the general look of my pieces as I’m working through them. Since this is so small it’s easy to keep the piece clean as you go. And truthfully, a piece this small doesn’t take much to clean up as you go in addition to the fact that once it’s roughed in, it’s pretty close to the final size. Not much more can or will be taken off. Once my roughing in is completed I’ll resharpen my chisels that I used and go over it lightly to blend odd cuts ,smooth the facets , shear the stop cuts . The thing is, carving clean should really start at the beginning as you’re setting in stop cuts. Paying attention to just how deep you set them with a mallet or by hand so they aren’t noticeable when you are finished. You don’t want to see the lines in the wood. The stop and paring cuts should meet at the exact same depth and point. When making the paring cuts to the stop cuts be careful not to over shoot the cut and leave chisel marks in the vertical sections. These areas are the most difficult to clean up well as opposed to the smoother curved surfaces of the rest of the carving. It’s in the bottom corners where the messes tend to be. Carve cleanly in these areas as it’s easier to finish it now than go back over the whole piece picking out fuzzies for hours on end. Do it right the first time , as they say, because their is never enough time to do it the second time. It’s just good carving practice to do it this way. Here you can see the overall size of the piece coming in at just 6 inches. Here you can see the relative thinness against my .5mm mechanical pencil. When areas get this thin delicate cuts and sharp tools are the way to go. Also, rather than making a truly vertical cut and risk the thickness of the chisel breaking off a thin piece such as this because it’s acting as a wedge, make a slanted cut instead. Once the waste wood is removed you can then shear down and make a clean vertical cut without pressuring the delicate detail you wish to keep. And yes, there is some cleaning up to do on some vertical areas where the grain tore out. Sharp chisels and careful shearing cuts will take care of these details with the final passes. Considering the scale,, and when you blow up the photo they don’t look very good,, but some of the stuff you see is the size of a grain or two of sugar. So,, not all that bad. The same delicate area from the opposite side. The amount of wood at the very tip of the veil seems to be only a few slivers of wood grain. Easy to break off. 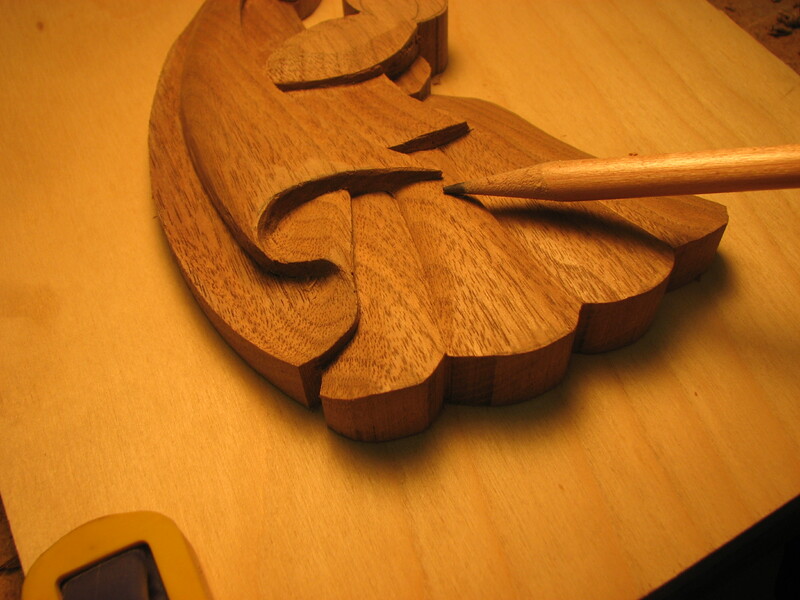 The shadows are important to follow when carving. 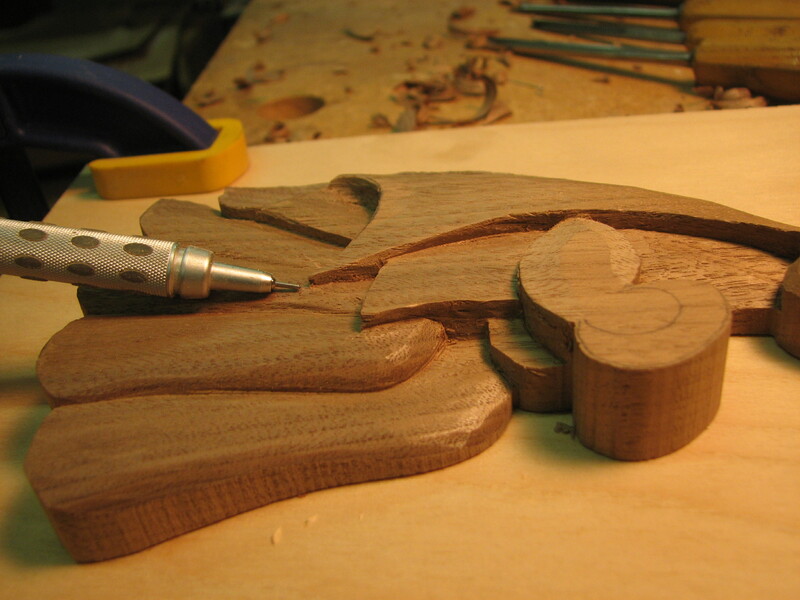 I generally use two lamps as I’m carving so I can keep playing with the shadows to see how the carving will read. The other reason for two is that many times your hands or tools are blocking the light as you’re making particular cuts and the second lamp illuminates your path if you happen to be blocking the light from the other lamp. Using only one lamp you’ll find yourself constantly moving it from cut to cut just to have the proper lighting. You need to see the shadows as well as illuminate the cut. And why are these pictured? Well, just for fun . They were sitting on the bench since I made them today and figured I’d include them as well. The center one was an existing brush, in terrible condition and I restored that one by removing the knot and replacing it with a new one and cleaning up the rest of the handle. The other two I made the acrylic, spun them on my lathe and then fitted knots in them as well. 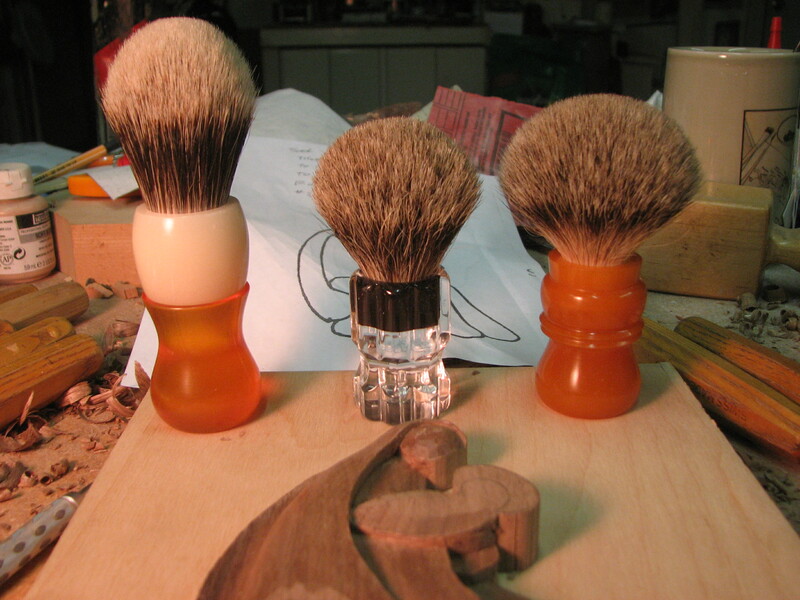 These are three entirely different Badger Hair Knots. I’ll post more photos of the carving as I get ready to sand it so you can see how I clean up a carving. After that point it’s sanding it, sealing it and then making the small star and frame. Should go quickly considering the time I have in it up to this point. Thank you for the detailed steps in carving this piece. I have learned and continue to learn so much by reading your thoughts on carving. I particularly like your comments on the lighting as well as the need to carve cleanly from the beginning. I will have to re read your post several times since there are many more tidbits of carving wisdom. Thanks and glad to hear you enjoyed it as well as picking up some tips. It’s a small carving but the pointers are applicable for any size piece. It’s just easier and faster on small ones as everything is so close and quickly done. My thoughts may not seem very sequential as I’m basically talking out loud as if someone were there to listen. At times they may be random , or repeated but if the thought enters my mind I just put it in the script. Hopefully you’ll weed through them and find what you need. And with some of the recent comments as I alluded to this seemed to be a perfect scenario to address some of them first hand. Talking is one thing, seeing is another. I also think that much of what I do is so second nature to me ( first really!) that I tend to not include what I take for granted. I need to include more of the little thoughts and sit back and consider just what is being done,, what I’m looking at and thinking about as I carve. The thoughts behind the carving are what drives the chisels to do what they do. Carving isn’t so much a physical process ( anyone can push a chisel) but the ideas, thoughts and intuitions that make them create what you want. Okay Mark, another ahh-haa monent … Angled cut into an edge to prevent breaking off the thin area – why didn’t I think of that? It was a real problem with the luan. Straight grain made it easy to chip off surface wood. Now I’ve got another tool in the arsenal. You just never know what you’ll find on this blog … gotta read it like a reference book – over and over again. If you have a section you don’t want to risk damaging, such as the very thin V section at the end of the veil ( I admit, I broke this section on the first one) there are a couple of ways around it. I used wood similar to yours, figured it’s a shallow cut but the wood reminded me how fragile it can be. One is to start the cut away from the actual line you want to follow. Clear out the waste and then you can gradually make the vertical shearing cuts back to the line you are following. Two, outline with a V tool first, again , removing much of the waste wood. Three, as I did here, make an angled vertical cut away from the line ( making half a V essentially) and proceed from there. You can imagine just what is happening. With a thin , fragile section at risk, driving the chisel in you are turning it into a wedge thereby exerting pressure from both sides of the chisel against the waste wood and the section you wish to keep. If you remove the waste wood the chisel now has nothing to press against and you can make slicing cuts to clean up the vertical stop cut more easily. I’ve always said most cuts are not made in one pass. This includes stop cuts. Make shallow cuts as the tip of the chisel is thinner . Driving it to your final desired depth just introduces more and more of the thickness of the chisel shank into the wood causing more pressure. Speaking of not making a cut in one pass, I ( don’t ask me why) started counting the cuts it would take to carve the baby . I stopped counting after 300. It’s not that I’m not sure what it should look by sneaking up on it but trying to do it all in one cut just introduces so many possible bad results. Especially on a small, relatively fragile piece. 1o small shavings allows you to control the depth, remove wood without any stress on other fragile areas and on a small piece as opposed to the risk in making one bold dramatic cut that is in the wrong place or just a bit too deep.Removing just an eighth of an inch too much , or getting off line by the same amount would just kill the piece. And trying to make one massive cut, you loose control. On a very large carving an eighth inch doesn’t matter so much. Here , and eighth inch is over half the baby’s head! Small cuts also reduce tear out. Another thing on a small piece you want to avoid. In some areas there isn’t much solid wood as opposed to slivers of grain that is holding some areas together. That’s another reason I do not care for chisels with “heft” or thicker shanks as many of the other popular brands seem to have. They do more damage. And with the number of stop cuts you make over a carving,, who needs the aggravation?